Last night Yvonne and I visited Trader Sam’s Grog Grotto and Tiki Bar at Disney’s Polynesian Resort. 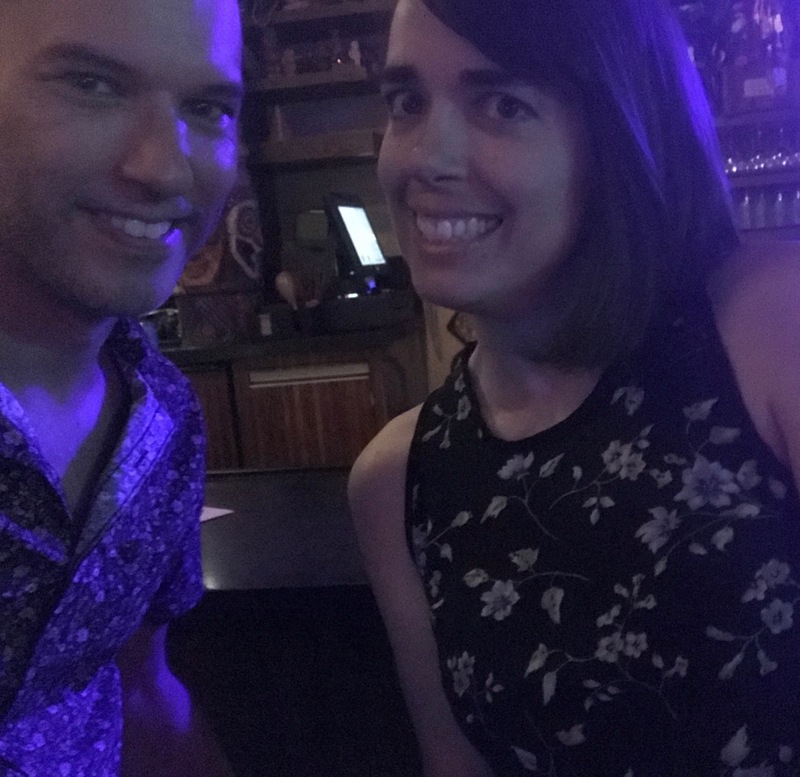 We started off the evening with dinner (and for me, a bit of late-night French press coffee) at the nearby Kona Café, then headed to Trader Sam’s just after 8:00 PM when kids were no longer permitted in the bar. 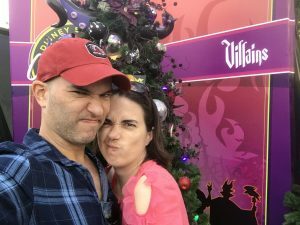 We had never been to Trader Sam’s before, nor had we heard much about it, so we were pretty surprised when it turned out to be a lot like the old Adventurers Club. The bartenders and wait staff would perform little mini-shows, wear goofy costumes, and use a variety of different props depending on what drinks you purchased, and every now and then various events would happen within the bar. At one point my barstool sank slowly to the ground, and the bartender gave me a child’s booster seat to compensate. The bar was dark and cosy and had lots of kitschy in-theme decorations lining the walls to enhance the mood. The place was quite small, and quite packed. Many of the patrons there seemed to know the place well, acting along with the various mini-shows whenever they occurred. The drinks at the bar were interesting – there was one five-shot drink served in a large Nautilus submarine-shaped gravy bowl, and others served in ceramic shrunken heads and the like. They were quite strong (made with multiple shots of rum, in some cases Bacardi 151), and of course expensive. Overall it was a neat place to visit. It’s been a relatively busy end to the winter season. 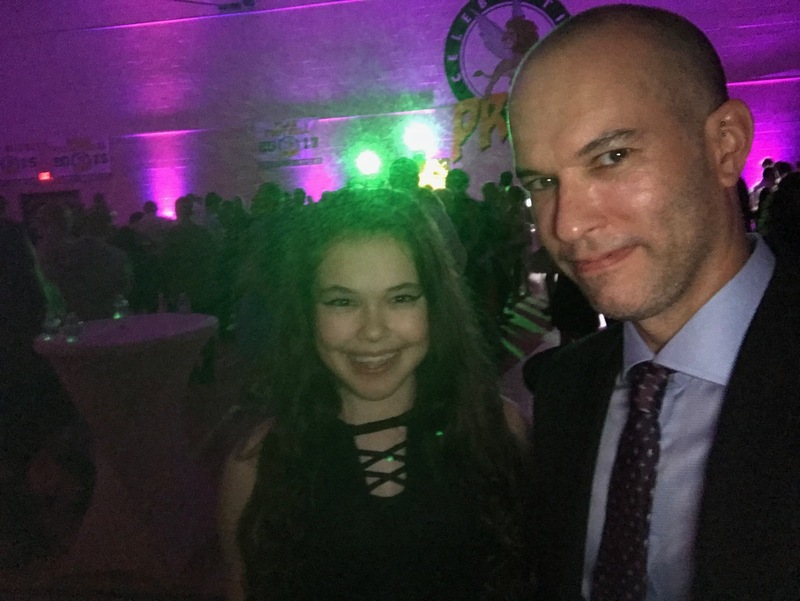 A few weeks ago I went to the father-daughter dance at Celebration School with Amelia, some of her friends, and of course their dads. It was pretty fun. 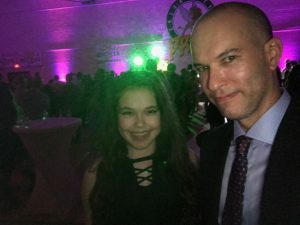 I’ve seen a lot of father-daughter dance photos coming from friends living all over North America lately so I guess it’s kind of a thing now. 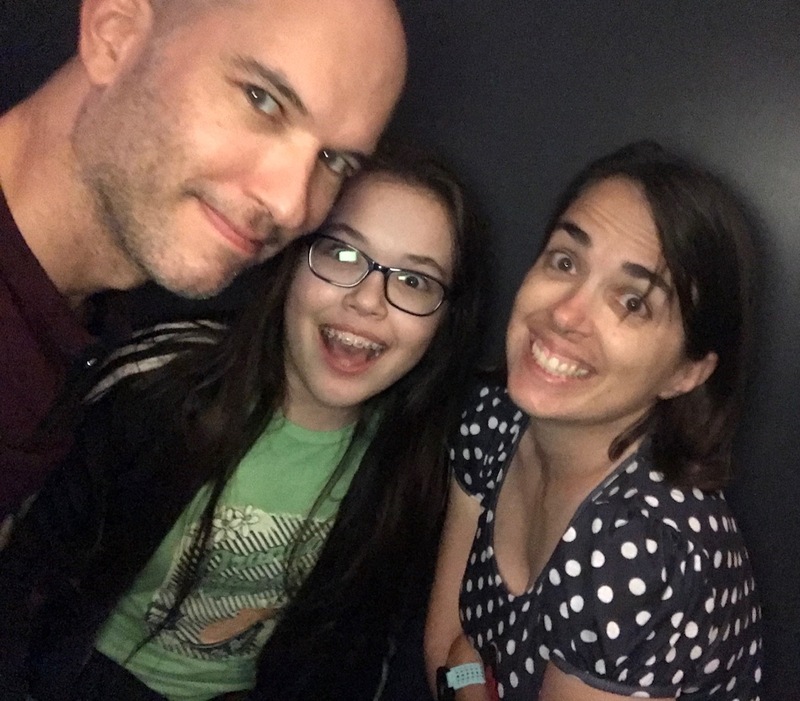 In early March I went with some friends from California to The VOID, a virtual reality experience at Disney Springs. The adventure they currently feature is called Star Wars: Secrets of the Empire. 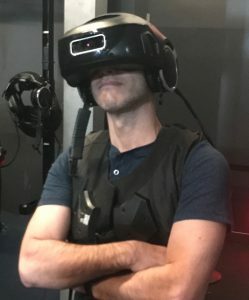 I’ve experienced several different offerings being touted as VR, and they all seem to fall short of being an actual immersive virtual reality experience. But this one was really quite well done. I didn’t get any pictures inside the actual adventure (they’d just be a bunch of empty rooms anyway, without the VR rig to breathe life into them) but here’s one of me afterward. 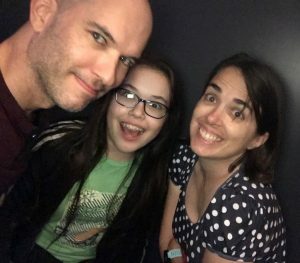 Later, I returned to The VOID with the family, and here we are in line (Callum was there, too, but didn’t want to have his picture taken). On March 10th we traveled with some friends of ours to Merritt Island, Florida to do a kayak tour with A Day Away Kayak Tours, a company that offers offer bioluminescence tours around the Merritt Island National Wildlife Refuge. We had originally signed up for the Dinoflagellate Bioluminescence Tour, but our tour appointment was delayed not once, but twice by two different hurricanes. 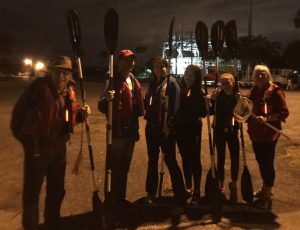 For Hurricane Harvey, the kayak tour operators actually traveled to Houston to volunteer to help out in flooded areas with their kayaks, which I thought was pretty awesome. Anyway, by the time we could get around to trying to schedule our tour a third time, seeing the dinoflagellates was no longer in season, so instead we did the Comb Jelly Bioluminescence Tour in the Indian River Lagoon. The comb jellies (which are not actually jellyfish) would glow when touched or held, and they don’t sting, so we got to capture them with nets, check them out, and toss them back into the water. We didn’t get any pictures in the kayaks, because it was dark and they wouldn’t have turned out (plus we didn’t want to drop our phones into the water), but we got one of our group right afterward. On St. Patrick’s Day I wore my Dublin GAA jersey and went for a walk with the family in Disney Springs. Disney Springs is located next to a lake (man-made, but still pretty wet) that you can walk around. 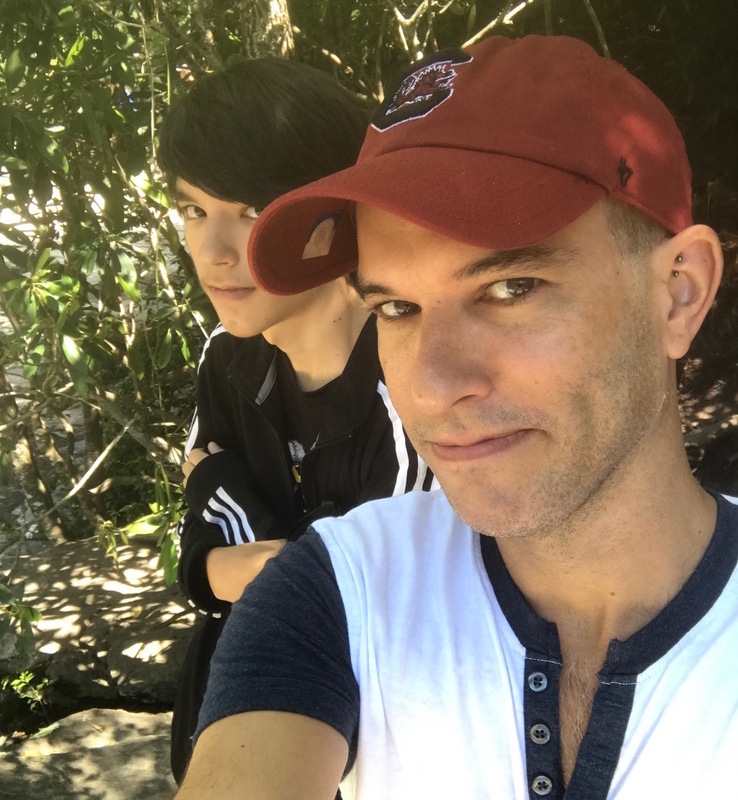 It was a nice, pleasantly cool day, and after our walk we went and had sushi at Splitsville. And while it seems like a bowling alley might be an odd place to eat sushi, Splitsville has made it their thing, and it’s not a bad thing at all. Finally, On March 18th (yes, the day after St. Patrick’s Day, meaning no green beer for me) Yvonne and I, plus our friend Carlos, completed the Excalibur 10-miler in Melbourne, Florida. It was a nice race, and the first longer-distance run I’ve completed in a few years. 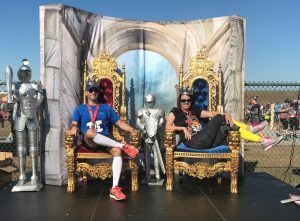 When we finished the race we received actual metal crowns (as well as finisher medals) that we’re wearing in the following picture. Which reminds me – it’s good to be the king, but wearing metal hats is uncomfortable! On Christmas Eve the family and I went to Disney Springs to check out the Christmas Tree Trail. 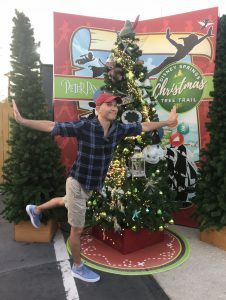 This is a path with different Christmas trees decorated in the theme of various Walt Disney characters or movies. 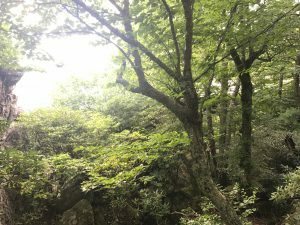 I was going to take a few pictures of the various trees along the trail, but really, it’s more fun to see them in person, so I didn’t. However, I did take a few pictures of us. 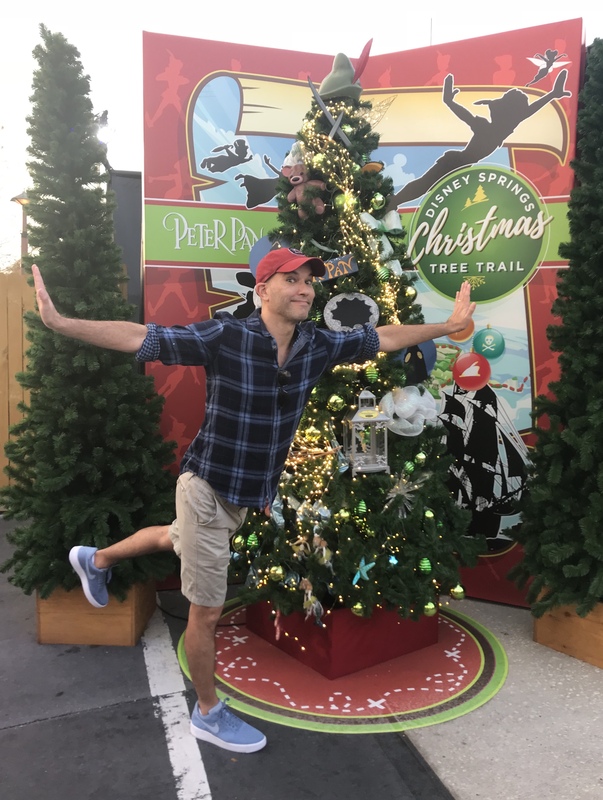 Me in front of the Peter Pan Christmas tree. 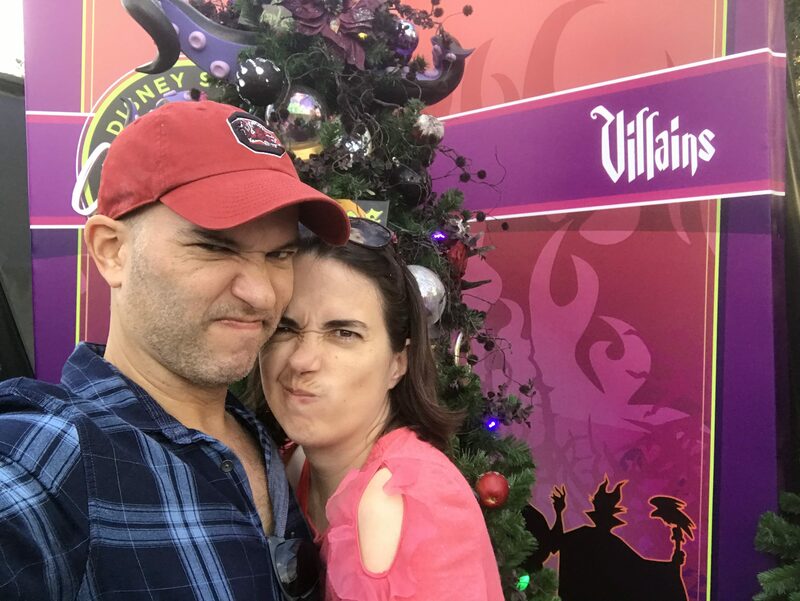 Yvonne and me in front of the Disney Villains tree, trying to look villainous. I think we failed. Me and the Sleeping Beauty Christmas tree. 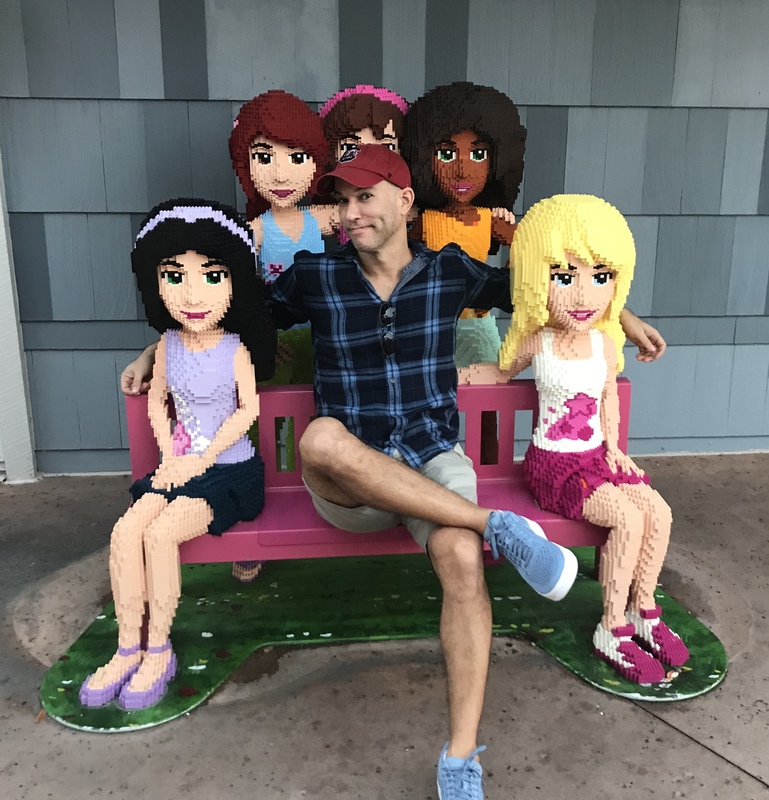 Me on the bench with LEGO Friends. So player. The snowfall (actually soapfall) in Celebration. 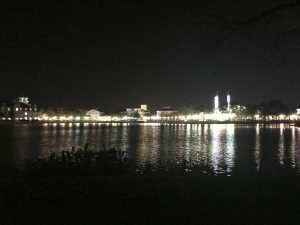 A view of Celebration from across the lake. So it’s not much of a secret that we go to Disney World a lot. Considering we live right next door and have annual passes (including to the waterparks), it only makes sense to hang out there. 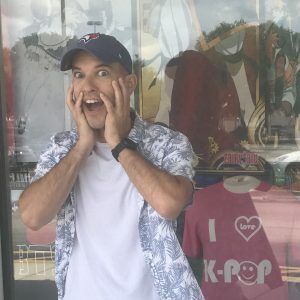 When you live next to Disney World, the best times to go are in the evenings. 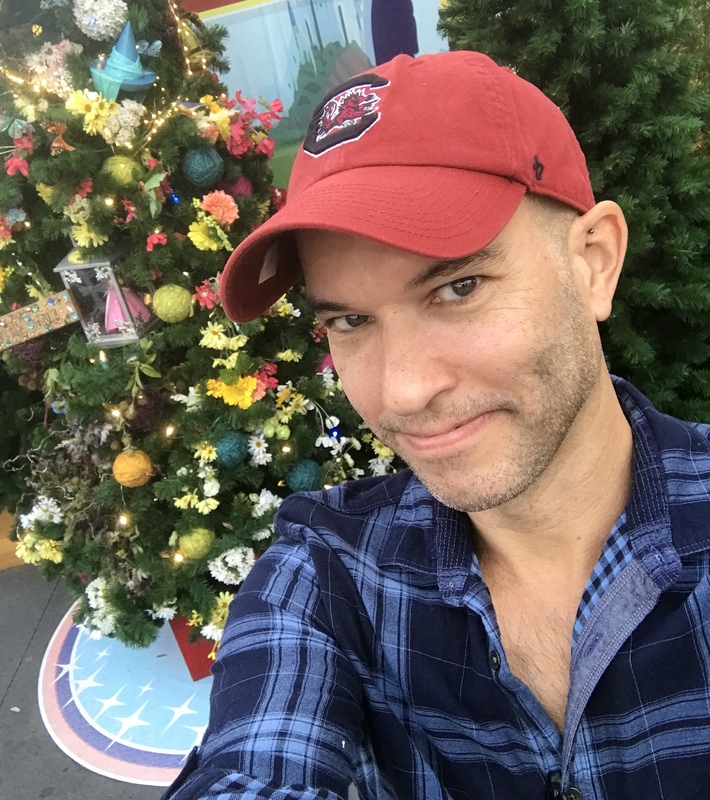 You can schedule a few FastPasses in advance for some attractions you haven’t done in a while, head out after school or on a weekend evening after the afternoon crowds have died down and the Florida heat has subsided, and spend three or four hours at a park. 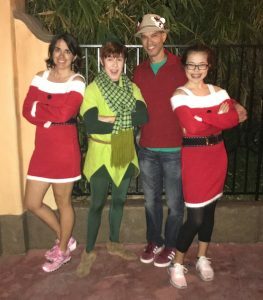 Yvonne and I may also sometimes go to Blizzard Beach or Typhoon Lagoon during the daytime when the kids are in school to float around in the lazy river for a while and plan for our next few weeks. A few days before Thanksgiving, Yvonne, Amelia and I went to the Magic Kingdom for Mickey’s Very Merry Christmas Party. I hadn’t done it before so I wasn’t sure quite what to expect. It is rather expensive, but since we’re living in the area, we may as well take advantage of it! Yvonne and Amelia had attended Mickey’s Not-So-Scary Halloween Party a few weeks before, in October, which is of a similar vein. And at the Halloween party, many guests had dressed up in Halloween costumes. So we figured that for the Christmas party, many people would do the same thing. Not so. We were some of the few people who dressed up for the event! 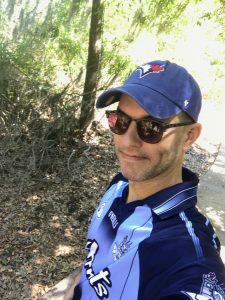 Fortunately, it wasn’t embarrassing or anything – we did stand out, but it was a good thing! 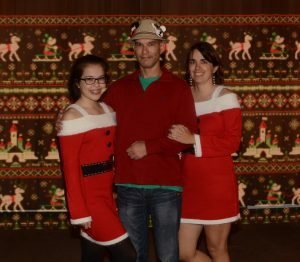 They were Santa Claus dresses, and I had two crocheted Mickey Mouse ornaments on my hat that Amelia and Yvonne crafted. It turned out to be pretty fun. 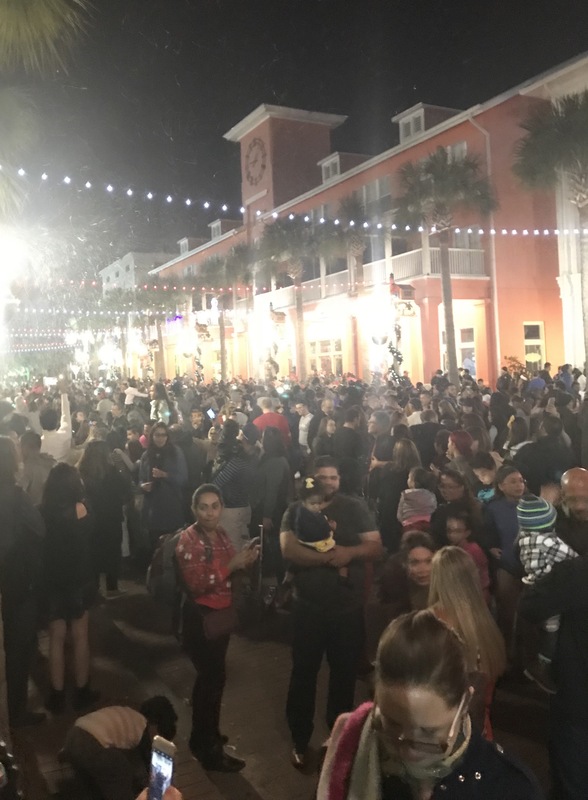 There were various stands with Christmas treats including cookies (gingerbread, sugar, snickerdoodle, and mint chip), hot chocolate, eggnog, chocolate milk, Dove chocolates, hot pretzels, and shaved ice. 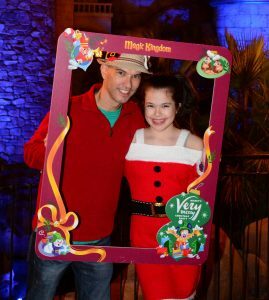 There were also many different Disney characters in attendance to take pictures with, including some rare ones – Scrooge McDuck and Peter Pan, for example. And the characters were of course dressed up in holiday attire. Considering its cost, it’s not something I would do every year, but we had an entertaining evening. I find the best way to have fun at a Disney park (or anywhere, for that matter) is to take advantage of what’s there and have fun. Don’t worry too much about expectations or if things aren’t going entirely smoothly. Just embrace it! Blurry iPhone shot of meeting Peter Pan at Mickey’s Very Merry Christmas party. The way they made the background for this photo was very interesting. A guy walked behind us with a stick of flashing LED lights that created the effect. 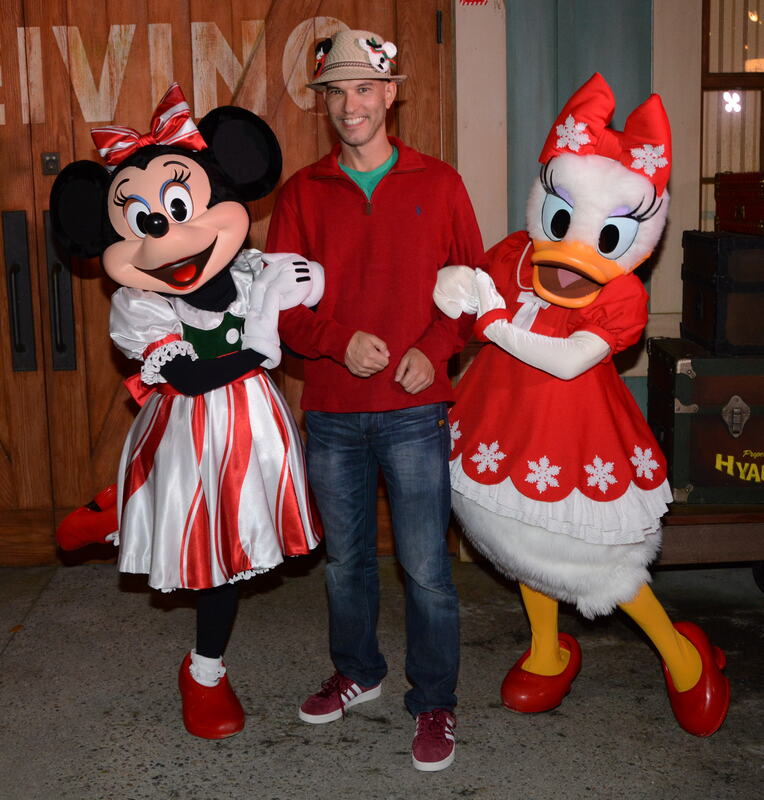 Me looking suave with Minnie and Daisy. 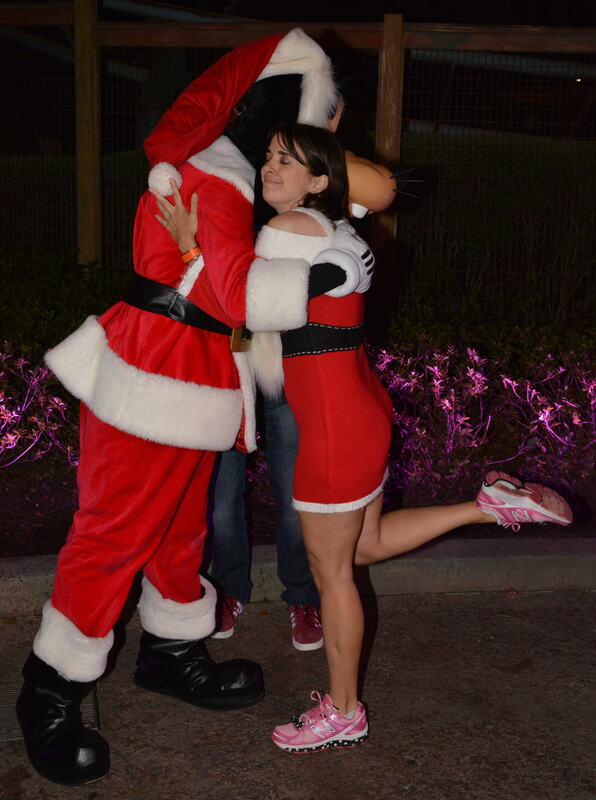 Yvonne with Santa Goofy. Should I be concerned…? 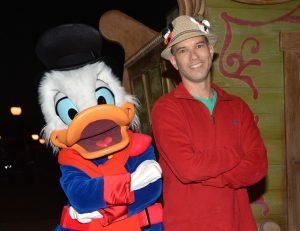 Me and Scrooge McDuck in holiday attire. I was hoping he’d invite me to come swim in his money bin. 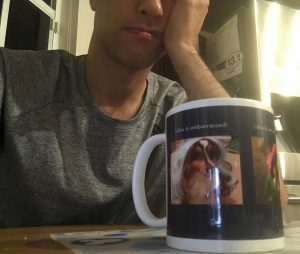 I’ve recently switched from coffee back to tea. I find the caffeine from tea is not quite as electrifying as that from coffee, which helps to even out energy levels. And since I used to drink a lot of Earl Grey tea before I switched to coffee, the scent of bergamot in the morning is bringing back memories of places lived and things experienced. I guess those are my deep thoughts for today. 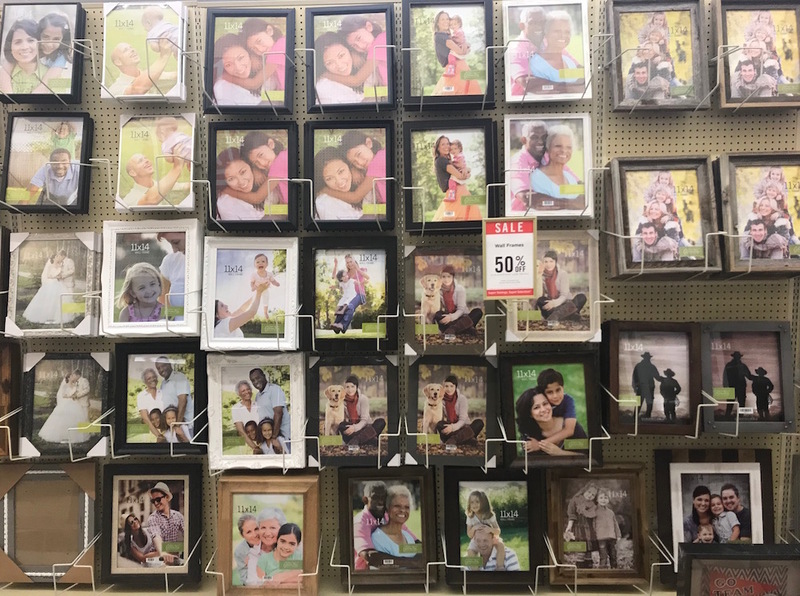 I could spend hours in a craft store making up stories about the people in picture frame stock photos. We’re currently at home in Central Florida, where Hurricane Irma is just now starting to make things very windy and rainy. Fortunately, it doesn’t look like the storm is going to hit the Orlando area with too much ferocity, though I feel very badly for all of the people in the Caribbean islands and to our south who have been severely impacted by the storm. 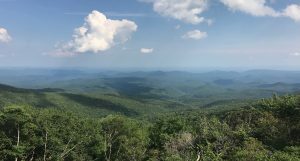 As we’re not able to do much during the hurricane, I thought it might be a good time to post some pictures I meant to post a few weeks ago from our visit to the mountains of North Carolina. 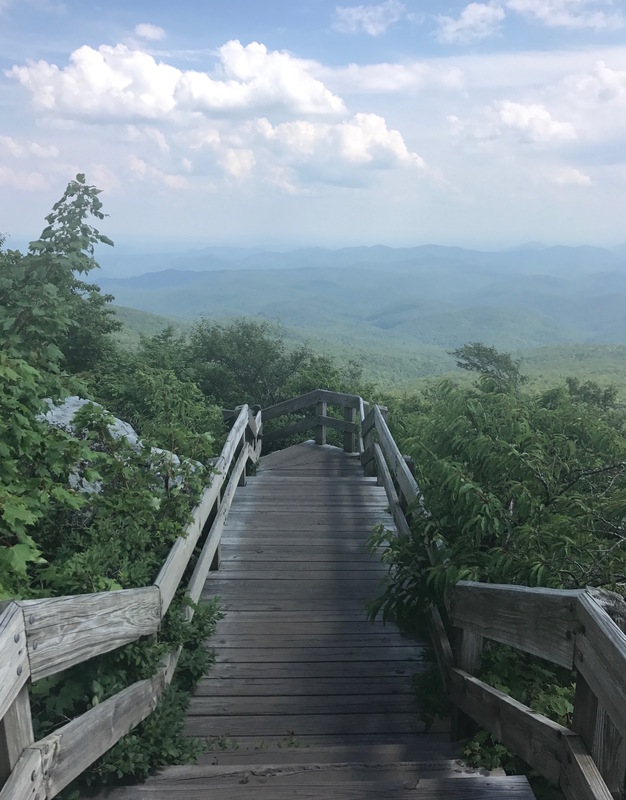 While we were staying in Sugar Mountain, we visited the Rough Ridge Hiking Trail, which can be found very close to the Linn Cove Viaduct along the Blue Ridge Parkway. The trail weaves upward from the highway, eventually reaching several really nice mountain lookouts. Callum and I actually took two separate trips up the Rough Ridge Hiking Trail on the same day; one during the daytime, and one right before sunset so that I could take some photos with my Nikon. 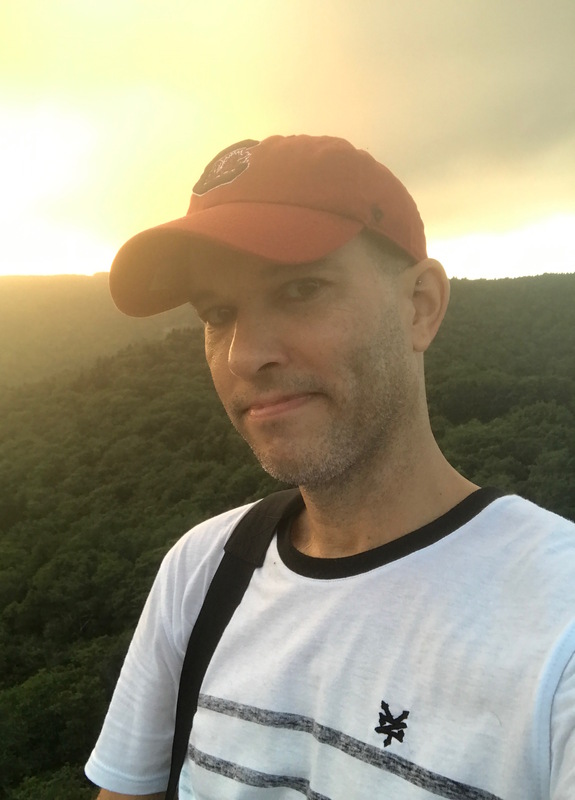 I really enjoy hiking in nature, having grown up hiking quite often in northern Ontario, and so I was very pleased to have had the opportunity to hike in the beautiful Appalachian Mountains. 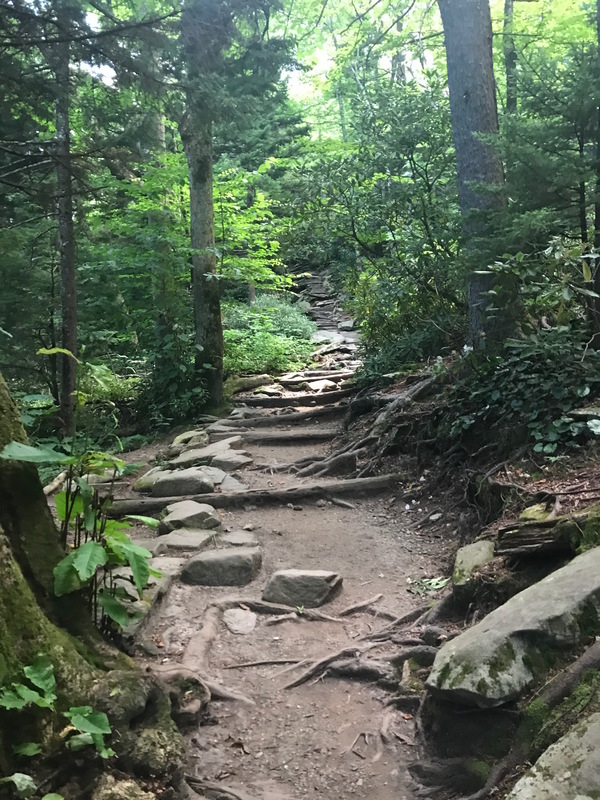 Climbing up the trail. Lots of boulders and tree roots to navigate along the way. A boardwalk path a bit higher up the mountain. Callum and I at a lookout along the trail. 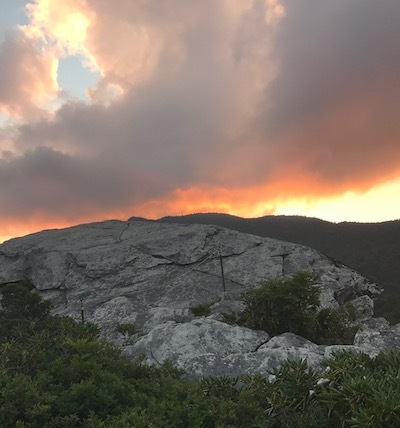 Sunset at one of the lookouts along the trail. 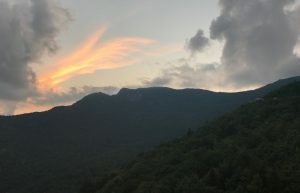 I liked how the way the clouds were illuminated by the sunset made them look a bit like a phoenix. I dig the yellow sky in the background. Callum and I are in Sugar Mountain, North Carolina. We’re staying at a condo my parents have rented for the summer up in the mountains. 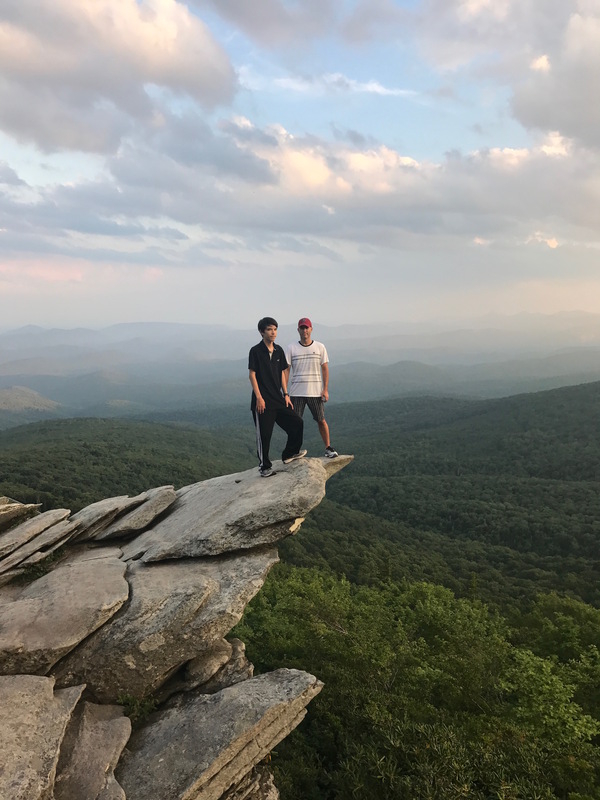 It is a beautiful area! And the weather is beautiful – quite a change from the heat and humidity of Central Florida this time of year. Today we went to Linville Falls, where Callum and I hiked up to the top of the mountain to check out the overlooks. 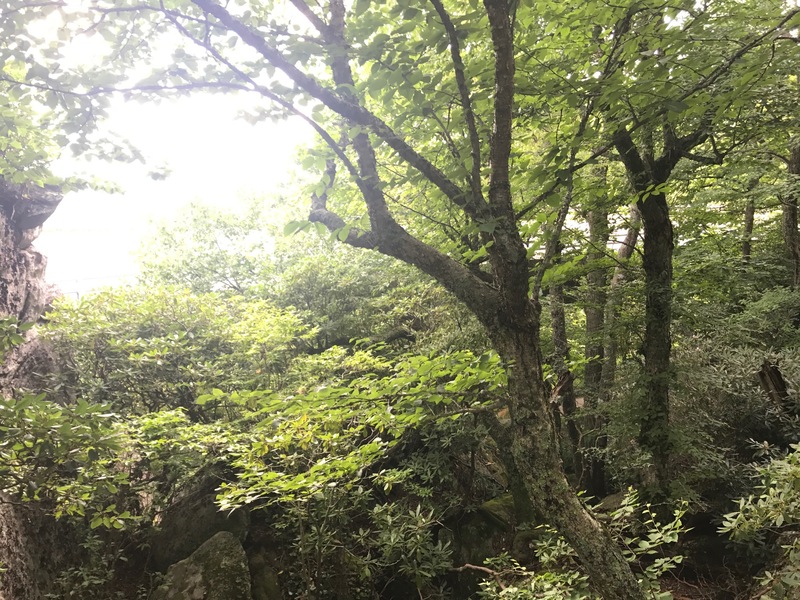 Afterward we went to the Linn Cove Viaduct, an impressive feat of engineering built into the mountainside of Grandfather Mountain. 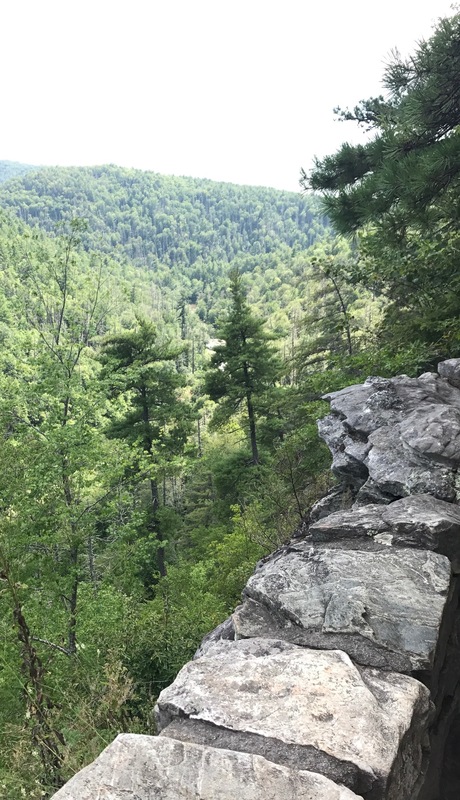 There was a short walk up to the viaduct along the Tanawha Trail that we did that included some fun boulders to climb, and an overlook nearby that we also stopped at to take a few pictures. 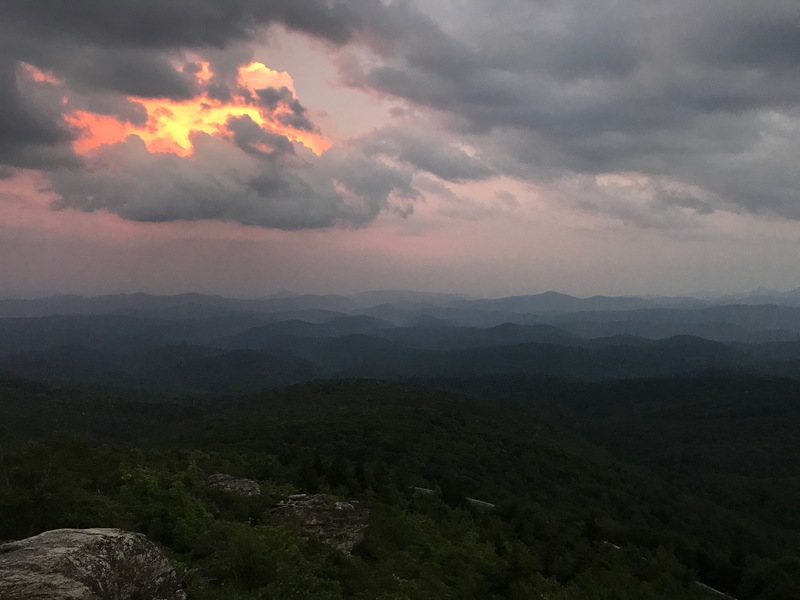 Tomorrow we are doing to head to either Blowing Rock or Banner Elk, two places I’ve not yet visited. I’m looking forward to checking them out. 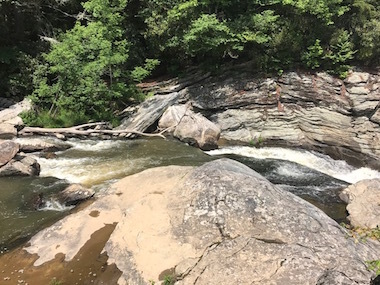 Callum and I at Linville Falls. 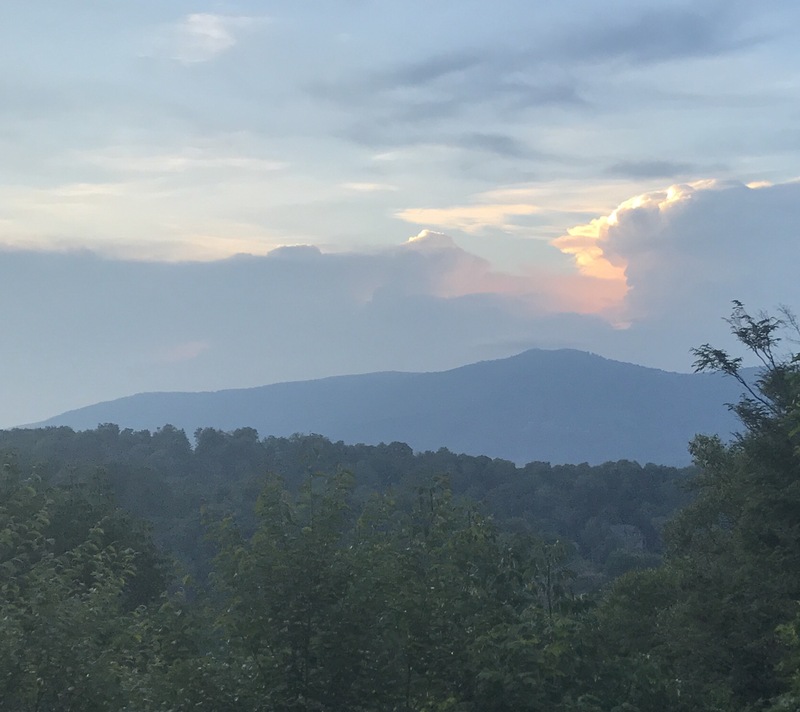 The view from the condo at Sugar Mountain. 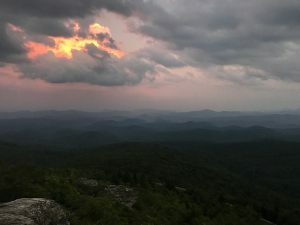 A lookout near Linville Falls. 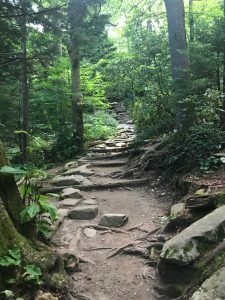 Along the Tanawha Trail near the Linn Cove Viaduct. The view from the overlook near the Linn Cove Viaduct. Last week I took a trip with some former co-workers to Merritt Island, Florida, home of the Kennedy Space Center. We visited the park, learned about rockets, watched an IMAX movie, and checked out the Atlantis exhibit. 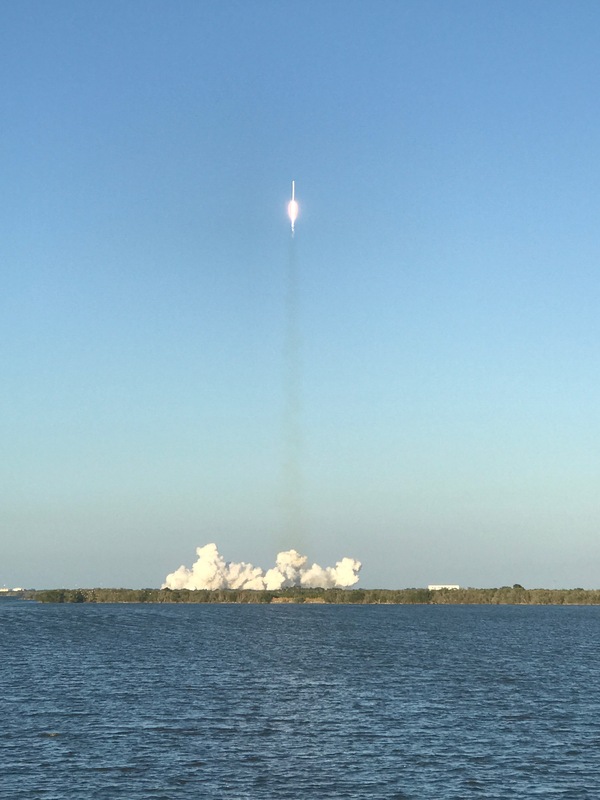 When we got to the park we learned that that afternoon there was to be a rocket launch as part of the SpaceX Falcon 9 program. My friends work out of one of IBM’s United Kingdom offices, and as such had never seen a rocket launch. I live here in Central Florida, and so… well, actually, I’d never gotten myself to a rocket launch either! So we decided we’d spend the $20 to get a shuttle to a nearby (but not too nearby) viewing area to see the rocket launch. One of the potential downsides to going to see a rocket launch is that if the launch doesn’t go through as planned for whatever reason, you’re out the money you spent to get to the viewing area. Fortunately for us the launch went mostly according to plan (it was one minute behind schedule – I can deal with that). It was pretty amazing to see the launch. You could initially see the fire beneath the rocket and the cloud of smoke billowing out from below. Then the rocket slowly ascends into the sky. Then, some time later, you suddenly hear the incredible booming of the rocket launch, which sounds like it’s right there in front of you (though of course it’s not). The rocket climbs further into the sky and reaches its Max Q, which is the point at which the atmospheric pressure on the rocket is highest. Finally it breaks through the atmosphere, tilts in a direction (in this case east), and heads out of sight. Taking the shuttle back to the Kennedy Space Center took a while – we sat around and had a few drinks and some snacks while we waited for the massive line to diminish. But it was definitely worth taking a trip to the viewing area to see the rocket launch, and I hope to visit the Kennedy Space Center again someday soon. It’s probably gonna happen. I got an annual pass.